The case against the Black Pink Triangle Association is not the first case opened against an LGBT organization in Turkey in recent years. The Interior Ministry has repeatedly attempted the closure of such organizations on similar claims. In 2005, KAOS-GL and in 2006, Pembe Hayat (Pink Life) faced closure cases. In 2009, Lambda Istanbul won its closure case after a lengthy legal battle. 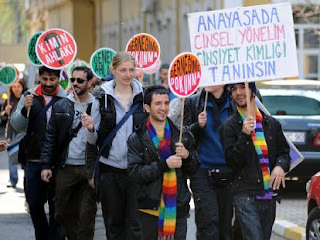 Black Pink Triangle is the first İzmir-based LGBT organization and was established in February 2009. Following the founding of the organization, the governor’s office complained that one of the articles in the Black Pink Triangle’s constitution was violating the Turkish civil code, in particular, paragraphs protecting Turkish moral values and family structure. The office also demanded the organization amend the questioned article and submit full documentation of the change within 30 days. Black Pink Triangle claims it met the deadline, however, did not alter the constitution, regarding such demand to be a violation of the members’ freedom of association. Following that incident, the İzmir Governor’s Office brought the complaint to the prosecutor’s office in May. "Certainly, the execution of the above mentioned articles 30 and 31 and the dissolution of the defendant association could still be demanded, if it would act counter to its constitution, in the ways of encouraging or provoking gay, lesbian, bisexual, transsexual and transvestite behavior or acting with the aim of spreading such sexual orientations." Sexual orientation or sexual identity cannot be changed through imposition. It is the fact both for LGBTT and for heterosexual people, admittedly the majority of the population. For the last 20 years, it is not the number of gays, lesbians, bisexuals, transsexuals and transvestites increasing, rather it is their individual and organized visibility that has been pressured and silenced until today. It is thus, unfortunate, that the court of appeal considers the organized visibility and rights struggle of the ignored LGBTT's, who are subjected to pressure and othering because of their sexual identity and sexual orientation, as a risk to society. The first trial of the closure case that has been taken to the 6th civil court of general jurisdiction of Izmir by chief public prosecutor's office after the recourse of Izmir's governorship with the claim that the 2nd article of its charter's being "against the general morality and the protection of family" is on 9 February, 2010. The closure case against SiyahPembe Üçgen Association is an attempt to block LGBT (Lesbian, Gay, Bisexual and Transsexual) individuals' right of association, whereas, it, for the communities that faces discrimination, is an absolute must. The only possible way to resist to isolation and exclusion for lesbians, gays, bisexuals and transsexuals that are under pressure of the social structures because of their sexual orientations and identities is unity and solidarity. There is no other discovered way to struggle against hate crimes, homophobic and transphobic discourses and discriminatory practises in publicity. In a world where heterosexism is rammed down people's throat as a divine reality, closing down the LGBT associations who are the only ones that can criticise all is the sign of an authoritarian mindset. How possibly should an association that was founded on the purpose of securing LGBT individuals' vital rights and while they try to exist economically, socially and culturally, preventing them being exposed to discrimination be closed? The black pink badge that LGBTs were forced to wear in Nazi Genocide Camps shall no more be the symbol of destruction and discrimination but a fight for a life that is based on living together with all our differences. As well as for heterosexuals, the constitutional rights and freedoms go for lesbians, gays, bisexuals and transsexuals! SiyahPembe Üçgen cannot be closed down, must not be closed down! As Jenny White writes, " as in Article 301 court cases accusing people of “insulting Turkishness,” the aim is often judicial harrassment, months of court appearances, legal costs, disruption of lives, and often threats in the street. You don’t need a conviction to do damage."